Wondering how your community can start a Native Plants Meadow? The benefits of creating an urban native plants meadow are many: habitat and forage for pollinators, increased stormwater infiltration of runoff on a site, increased plant bio-diversity, potential for informal learning about eco-systems….These are just a few of many reasons. 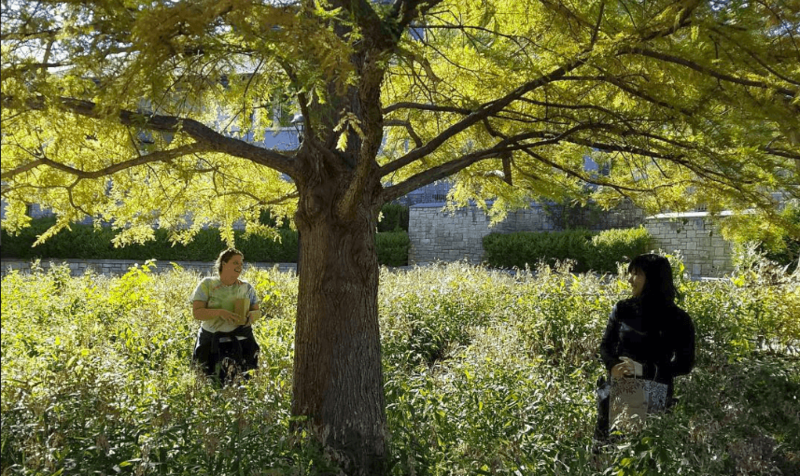 Related to establishing community meadows, Katie Kingery-Page recently gave a keynote address to the Kansas Native Plants Society, “Ten Lessons for Urban Native Plants Meadows.” See a summary of this talk on the Dyck Arboretum of the Plains blog. The Meadow blog’s mission is to be a living archive about the Meadow and a helpful resource for those interested in community-based native plants meadows. 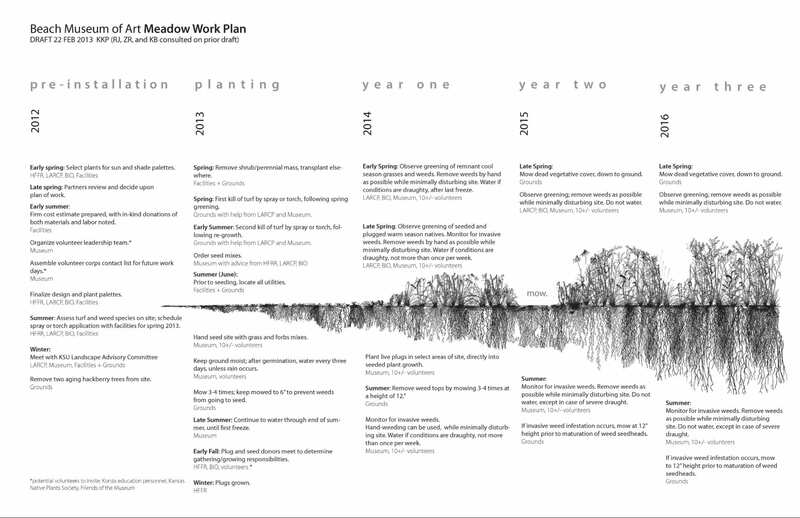 We’ve been digging through our archives from the very start of Meadow planning and selected this Plan of Work document to share. It was an evolving document and later changed to reflect roles of the Meadow partners. 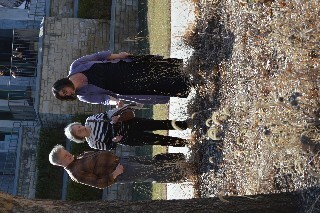 For example, faculty in K-State’s Department of Landscape Architecture and Regional & Community Planning, along with Beach Museum staff, have led Meadow maintenance with the help of so many terrific volunteers. 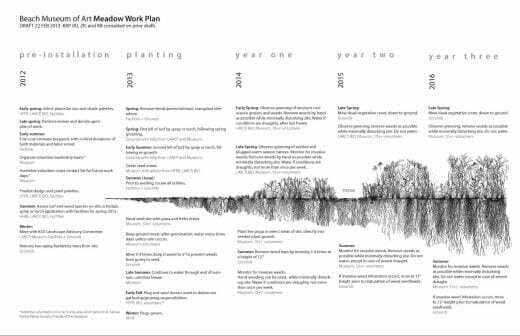 If your community is planning a meadow, we recommend having a clear document assigning roles and outlining the work needed to build a slow landscape. Below is our example. For more on slow landscapes, see Elizabeth K. Meyer’s article “Slow Landscape: A New Erotics of Sustainability” in Issue 31 (2009) of Harvard Design Magazine. K-State Meadow Plan of work, 2013 version, from the project archives. a new batch of interpretive signs based upon 2016 monitoring in the Meadow, funded by an EPA grant and led by K-State’s Prof. Jessica Canfield. dedicated volunteers (both long standing folks and fresh faces). a renewed commitment to community-based processes and chemical free native plants landscapes. These themes will be explored more fully in a series of blog posts in 2019. Please follow the blog for updates, and follow @themeadow_kstate on Instagram for even more updates! Seed scattering by volunteers Aileen and Erin. Fred Henley (BLA 1960) and Judy Henley (BS 1959) recently established the John and John T. Henley Meadow Excellence Fund as a resource for interpretation and maintenance of the Meadow. The Henleys are interested in the Meadow’s potential to serve as a “pointer” to the nearby Konza Prairie and as a resource for interpreting Kansas grasslands. 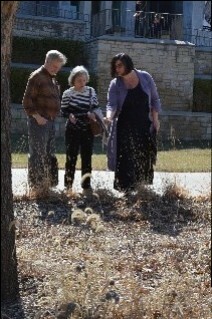 The Henleys (left and middle) visit the Meadow with landscape architect Katie Kingery-Page in March 2015. Image by Richard Dean Prudenti. Thanks to the Henleys, 400 new plant plugs of little bluestem were added to the Meadow in May 2015 and a seasonal student employee has been hired to help with Meadow maintenance. The Henleys gift will help fulfill many needs at the Meadow. If you’d like to learn more about supporting the Meadow, please contact Katie Kingery-Page at kkp@ksu.edu.